Should You Go Mobile with Your Optometry EHR? Mobility. Everything today has gone mobile. From banking to taxes, and now even healthcare and patient medical records. It's become more and more prevalent to see ODs and other healthcare providers using laptops, tablets, and smartphones in the exam room. Mobile technology allows you to stay connected with your information from anywhere. And while there is a lot of buzz around the trend of mobile healthcare, there are also a lot of questions. So we're going to talk about what other healthcare providers are doing when it comes to mobility and questions you might have when it comes to HIPAA and the security of your data. To give you a little more definition of what we mean by going mobile with your optometry EHR, we mean using an EHR software that is cloud-based and allows you to access your system and data from any device, in any location, with an Internet connection. What are healthcare providers doing when it comes to cloud-based EHR? While is may seem like everyone is pushing the trend in mobile, let's take a look at a few numbers. In a 2014 report by Epocrates, 84% of healthcare providers surveyed have adopted an EHR, and 32% reported that their EHR is optimized for mobile. On top of that, some of the top functions that healthcare providers are performing on mobile devices include accessing their EHR, taking notes, E-Prescribing, search, communication with colleagues, and accessing medical resources. What's so great about mobile? Having mobile access to your software comes with its benefits. Here's a few reasons why healthcare providers are excited about cloud-based EHR. You're Going to Save Time, and Money. Any time that you're able to increase the speed and productivity of your workflow you're going to be saving money by saving staff time and seeing more patients. On top of the money you'll save from increased efficiency, cloud-based systems require no hardware or software installations so your set up costs are going to be a lot smaller than with a client-server software option. Unlimited Access to Resources Leading to Better Decision Making. Using a mobile software on a tablet is going to help you better access and share medical information with your patients. Having access to medical resources, educational images, videos, charts, and clinical decision support through your EHR software is going to help you share information easily and build trust with your patients. Constant Communication. Since you, your staff, and your patients (via a patient portal) can access your system from anywhere by securely logging into the system from any device with an Internet connection, you'll be able to keep in touch more frequently with other staff members and patients to increase their quality of care. Less Disruption for Your Practice. With cloud-based mobile software you're going to see less disruption in your office when it comes to implementation, training, and updates. Since there is no hardware or software to install you won't have to worry about shutting down some of your computers to get the software up and running. Training can be worked on from outside the office since you can log into the system from anywhere, and updates are all taken care of by the vendor and occur more frequently than they would with client-server software. And, automatic updates ensure that you're always working with the latest technology. Should you be worried about HIPAA? Interested in making your practice more mobile? 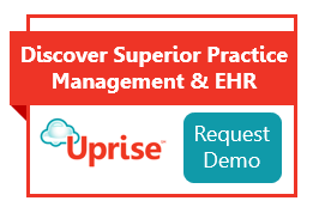 Check out Uprise, a cloud-based practice management and EHR software made just for optometrists!